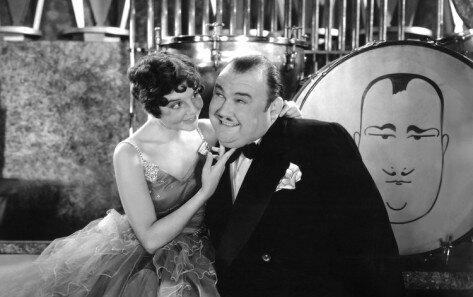 Jeanie Lang and Paul Whiteman in "King of Jazz"
Paul Whiteman, known as “Pops” and referred to as “The King of Jazz” by the 1920s press, led the most popular dance band of the Jazz Age. He is best known for his blending of symphonic music and jazz as typified by his 1924 commissioning and debut of George Gershwin’s jazz-influenced Rhapsody in Blue. His orchestras featured some of the best musicians of that era: Bix Beiderbecke, Frank Trumbauer, Joe Venuti, Eddie Lang, Jack Teagarden, Bunny Berigan, Red Norvo, the Dorsey brothers, Red McKenzie, and the Rhythm Boys: Bing Crosby, Al Rinker and Harry Barris. Of the more than 600 recordings made by the Whiteman Orchestra, 32 were #1 hits and included such classics as “Whispering” (one of the first records to sell over one million copies), “Valencia,” “Japanese Sandman,” “Smoke Gets in Your Eyes,” “Wang Wang Blues,” and his last, “Wagon Wheels.” Billie Holiday, Mildred Bailey, Hoagy Carmichael and Paul Robeson all recorded with Whiteman, who wrote more than 3,000 arrangements and provided music for six Broadway shows. At the height of his popularity, eight of the top 10 sheet music sales were tunes introduced or featured by the Whiteman Orchestra. His orchestras were usually composed of up to 35 musicians as compared to the typical dance band of 8 to 10 members. In 1922, he controlled 28 ensembles on the East Coast and earned more than a million dollars. He is quoted as saying: “Jazz is the folk music of the Machine Age.” His popularity waned with the coming of the Swing Era, and he was semi-retired from the music world by the 1940s. His library is now housed at Williams College in Williamstown, Mass.